PCH, Truck Bed Edition: Honda 600amino or Dodge Vanpage? A French hydropneumatically-suspended diesel managed to win a photo finish against a V8-powered Malaise Lotus in our last Choose Your Eternity poll, which means we'll need to have another English Channel Hell Project Battle right soon. But today we need to go to the PCH Tipster Mailbag (which, sorry to say, I haven't been using as much as I should, due to the fact that I still haven't had a chance to crank up the PCH Tipster T-shirt assembly line) and check out a couple of real humdingers sent in by Bumblebee. These are machines any sane Jalopnik reader would dream of owning... yet actual ownership of either one would lead to plenty of wake-up-screaming nightmares! 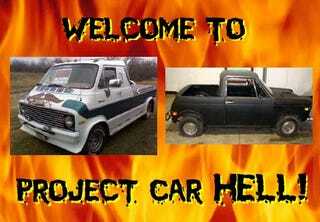 Project Car Hell: Citroen CX Diesel or V8 Lotus Eclat? We saw a Honda 600 in this series not long ago, and three of them before that. However, we have no choice but to return to our favorite motorcycle-engined Japanese car, because this here's a 1970 Honda 600 with truck bed. That's right, a 600amino with the hard part already done! We don't know how much it really costs, because the seller is "keeping the auction fair" by using a reserve price. But it'll probably be pretty cheap, because it's been sitting for at least three years (and perhaps 30 years before that) and, well, stuff goes wrong when a car sits for years. And how about the damning-with-faint-praise statement "ENGINE NOT SEIZED?" Sure, it might have an oil pan full of metal chunks, but you can still turn the crank! Not only that, it's "VERY UNIQUE," which is crucial for those of us who don't want somewhat unique cars. Just drop a Hayabusa in the front, a couple cases of Milwaukee's Best in the back, and you're ready to go! Now you're probably saying to yourself, "There's nothing that can compete with a 600amino!" Normally you'd be right, but Bumblebee managed to find something that should send you staggering back in awed disbelief: this '74 Dodge van with truck bed. It's got the custom graphics, including an amazingly patriotic "TOY TRUCK" screamin' eagle on the hood. It's got the marker lights on the roof and the mis-aimed Malaise Style fog lights in the grille. It's got the deep-pile shag carpeting in the cab and even the CB radio. But most of all, it has stacks! Like the 600amino, this Vanpage has been sitting for a while- 10 years, in fact. But don't think of it as a nightmare of shrunken seals and cracked gaskets- think of it as a time capsule! The seller claims it starts and drives, and that the "AIR CONDITIONING works AWESOME." It comes from the seller's uncle in southern Kentucky, so it's authentic. We figure a quick trip to Tijuana for some interior upgrades and some 440 power and you'll be feeling mighty sharp in your new Vanpage.